The whole winter season is almost over, and spring is just around the corner. So, a lot of architecture-related agencies and corporations can’t wait to impress the world with new gorgeous projects. If you’re one of these architecture masters, this post is definitely for you! Being inspired by online business prosperity, we continue creating various free samples for multiple business niches, and architecture is not an exception. Therefore, if you would like to boost your agency on the web and empower your business campaign with a captivating and professional-looking website, hurry up and get this free architect WordPress theme now! Our brand-new Grafique will help you practice building the website of your dreams, so, you could state your company in the best light, make a lot of new clients, and take it to the whole another level. All you need is to download the theme’s pack on your desktop. After that feel free to dive into an exciting site’s building process! First things first, let’s discover what this theme has inside and outside! 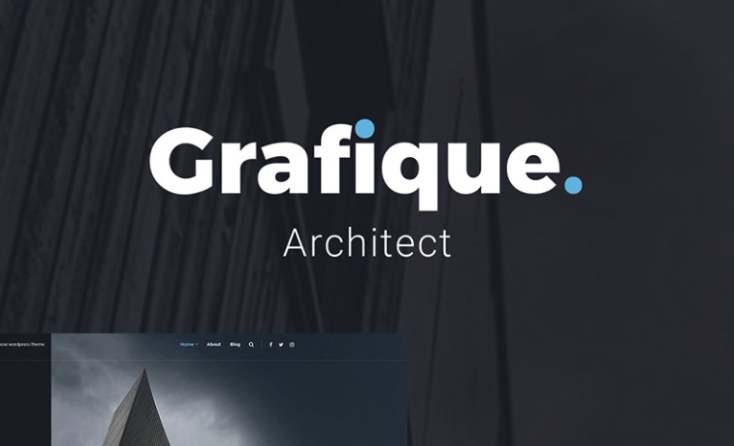 Grafique comes with a strong foundation, which is Power Page builder. This modern website builder boasts drag-and-drop functionality. Therefore, you can easily compose top-notch layouts of any complexity with absolutely no need to code! Being cross-browser compatible, this free architect WordPress theme is pre-loaded with WordPress Live Customizer. This tool will help you to edit your website without reloading the page. Feel free to add, delete, or start over in a real-time mode. This theme has a wide range of useful content modules, which will help you to add various counters, buttons, accordion, blog, blurb, and much more! That is how you can easily create a good-looking website and capture different audiences. Grafique comes with a simple step by step documentation, a valid and clean code, and a quick and clear installation process. So, you will get started working on your architecture site’s project on the fly! Being truly SEO-friendly, Grafique boasts a fully responsive design. Therefore, it will look brilliantly on any modern device! As you noticed, this free WordPress theme has everything you need to learn website building. By the way, look at the demo to see plenty of other amazing features. Also, if you would like to go live with your site’s project after training, view our premium architecture WordPress themes collection! Do you like this free WordPress theme? Please, let us know in the comments section below! Meet upcoming spring with joy, prepare a lot of successful architectural projects, and thanks for reading! This entry was posted in Architecture, Free Stuff, Free Themes. Bookmark the permalink.